Shortly after President Barack Obama’s administration unveiled the new College Scorecard following the 2013 State of the Union, the public began voicing their opinions on the interactive tool, which is designed to help families compare colleges based on where they “can get the most bang” for their educational buck. We decided to reach out to a few players in the collegiate world and have them try out the College Scorecard. They share what they loved, what they loathed, and what needs to be worked on. The tool allows students to search for institutions based on degree/major, occupation, zip code, size, awards offered, state, campus setting, region, and distance education. Users can also search the school by name. Most who reviewed the tool found it easy to use, including Andrew Wilkinson, executive director and cofounder of StudentDonate, a nonprofit organization whose mission is to help students afford a higher education. “It seems pretty comprehensive and certainly has some pretty advanced filtering options that will help students narrow down to schools that meet their criteria,” Wilkinson said. Laura Pereyra, communications analyst for NerdScholar, a student consumer education website, said she found the options to search by major or career area of interest to be the most valuable. Keyana Scales, director of undergraduate admissions for North Carolina Agricultural & Technical State University, a public historically black college with about 9,000 undergraduate enrollees, said the tool is useful in driving the conversation of choosing a school. The College Scorecard provides the following information for each institution: net price (what undergraduates pay after accounting for grants and scholarships), the graduation rate, the loan default rate, and the median borrowing amount. The tool also links to each school’s net price calculator. While cost is unarguably a big, if not the biggest factor in choosing a college, some believe the College Scorecard misses the mark by focusing so much on the price tag. “Basically, it tries to force the student to ask certain questions about cost, which isn’t a bad thing but it tries to apply a one-size-fits-all mentality to college even though the categories are meant to express variety (size, type) and that is the polar opposite of what college is. College is about fit,” said Prescott College’s Sajko. Prescott College, a private, not-for-profit liberal arts college in Phoenix, Arizona, has an undergraduate population of about 800 students. Sajko said the manner in which some of the information is presented on the scorecard does not make sense and compared Prescott College to Princeton University, as an example. Chris Cullen, managing director at Infinia Group and who previously served as chief marketing officer for The Johns Hopkins University in Maryland, also took issue with the scorecard’s focus on cost. With the amount of information available for each school within this tool, there will always be a question of accuracy. The scorecard uses institutional data from 2011. Some experts have argued that because the information is based on averages and medians that the borrowing and default figures are misleading. Others think the criticisms of the scorecard putting so much emphasis on cost are off-center because the unfortunate reality is that most students don’t have the luxury of ignoring finances when considering colleges. 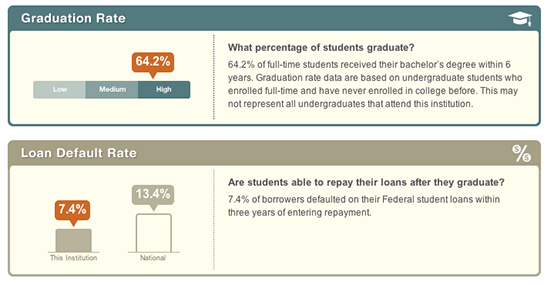 The scorecard is also lacking when it comes to employment of graduates. Currently, the employment section directs users to ask their prospective institutions for information about jobs and earnings for its graduates, but it also says the U.S. Department of Education is working to provide information about average earnings of graduates. Sajko said employment data and career outcomes would be extremely difficult to track, noting that he is in a job he never knew existed when he attended college. A recent letter to the editor at The New York Times from Harvard University President Drew Gilpin Faust, whose first job after graduating college was a low-paying position with the Department of Housing and Urban Development, suggested that graduate salaries aren’t a good indicator of an institution’s quality because some graduates base their career success on personal satisfaction, not salary. User feedback and response is going to be a necessity in improving the tool as well as pointing out areas in which to improve upon. Wilkinson suggested the scorecard add a peer review section, similar to the feature on Yelp. When searching by degree and major, the list of options are in some sort of a quasi-alphabetical order. Simplicity is better, so full alphabetical order would be best. Scales mentioned she would like to see direct links to the institution’s websites so that students can explore top college choices in greater detail. Pereyra also suggested the tool provide students the ability to compare schools side-by-side. Presently, students have to look at their options one at a time. Sajko said it would be helpful to include narratives that explain each college. “[The scorecard should] really let each college explain these categories rather than setting up yet another reporting structure which the government must now run,” he said. When searching by occupation, the results show institutions that don’t clearly define how they were yielded. In other words, if students search by occupation for public relations specialists, they are given a list of schools – but are these schools that offer degrees in this occupation, schools that graduate a significant amount of public relations specialists, schools that are well-known for public relations specialists, etc.? These questions can easily be answered by including a paragraph explaining the criteria for how the institutions are selected. Reviewing the College Scorecard, many of our findings echoed those of other experts: we’d like some employment information and a side-by-side comparison tool would be nice, but overall the tool offers plenty of information about some important factors, including cost and borrowing, which makes it a great resource and jumping-off point for prospective college students and their families. It’s also important to remember that the College Scorecard is not the end-all, be-all for selecting a school to attend, and it was not designed to be. As Scales mentioned, it’s not meant to be the only source of college specific information. Rather, it’s a way to drive the conversation between students and college personnel and focus on student success.